Johannes Brahms was a man of contrasts. His serious Teutonic music was balanced by joyful dance music. His miserliness with himself by exceeding generosity with family and associates. His kindness to working people with a biting, malicious wit reserved for those he encountered in artistic and aristocratic circles. He was not an easy man to know, destroying a good deal of his own work and almost all of his lifetime's correspondence, in later years even collecting his letters from friends so that he could consign them to the flames. Yet you can know this enigmatic genius through this 8-lecture series, which uses biographical information and musical commentary to link the complexities of Brahms the man with the electrifying music of Brahms the composer.You'll learn how Brahms found unique ways of combining the rigor and formal complexity of older Classical and even Baroque genres and forms with the melodic inventiveness, harmonic sophistication, and expressive richness so prized in the Romantic age. And how his fanatical perfectionism led him to write, rewrite, and ultimately destroy more than 20 string quartets before publishing a pair of exceptionally exquisite pieces at the age of 40, breathing new life into the old bones of this exacting chamber music form. "His legacy," notes Professor Greenberg, "is a lifetime of extraordinary craft and artistic beauty without an inferior piece in the collection." How have I gone so long in life getting so much joy from the works of Brahms without understanding something of this great composer and his life. How many times has my heart been lifted listening to his violin and piano concerti, his symphonies -- oh, why did I start making a list, all his works are all wonderful. Upon downloading this series of lectures,a new and eminently accessible view of Brahms was revealed. I've only just finished listening and I am still under its spell. Yet, for the listener who knows little or nothing about classical music, let alone who Brahms actually is, this would be an inspiring introduction. Professor Greenburg is funny, insightful, compassionate, and at times, delightfully satirical -- in short, a clever and effective communicator. Infectious, really. I enjoyed this course very much. I would listen to another course by this presenter. I alternated between listening to it and listening to Brahms recordings. I have a wonderful collection of favorite Brahms recordings now thanks to this course. This and Brahms music got me through a difficult time. The focuses on his life, but has plenty of examples of his great music. Each of these courses draws me in and illuminates so much that is new to me even with a masters degree in music. Can't wait to hear the next one! Simply, this is at the top of all classes. If you are a Brahms fan, you will be absolutely enthralled. But, if you enjoy music, and history, and biography, and memoir... well, if you want to be delighted, moved, intrigued, taught, and spend some time with some of the greatest in music, you should get this class right now. You will not regret it. Thank you, Professor Greenberg! And thank you, Brahms. After this I will indéed listen to the music the Professor recommends. This was so educational, yet amusing at the same time. I will listen to this course more than once. Back in the day, I was not a fan of Brahms' music. Emphatically so. As a result I believed the critics who said he was not deserving of the praise heaped on him. And then two things happened. First, I fell hard for the Academic Festival Overture, and began to listen to other works of Brahms with a more open mind. Second, I listened to this course. I've said before that Professor Greenberg has a knack for sharing his enthusiasm about a composer, and he purely loves Johannes Brahms. He also has a knack for contextualizing composers and their music in terms of not only their life experiences, but historical events and trends as well. And in this case he does a beautiful job of giving us a young Johannes who was set to play piano in Hamburg brothels when he was just a child. A natural musician and composer, a man who was a puzzle even to those closest to him, and a composer who, in holding to the rigorous musical forms of the past while expressing the spirit of German romanticism, produced work that made him the true heir to Beethoven, Mozart, and Bach. Brahms had issues. His childhood experiences in Hamburg brothels soured him on women, and though he fell in love several times in his life, he never married. Possibly this was as much a result of his mania for freedom which kept him from taking any real jobs for most of his life, as it was the trauma of those early years. But he led what appeared to be a happy, orderly life, had a great many friends in spite of his famously wicked temper and general grumpiness, made a good deal of money, which he then gave away freely, and not incidentally produced some glorious music. I admit that the professor has some weird verbal tics. He's often over dramatic (You should see one of his video courses!) and a bit goofy, but his information is top notch and I don't think you could do better for clear, concise, and memorable learning experiences on music and music history. 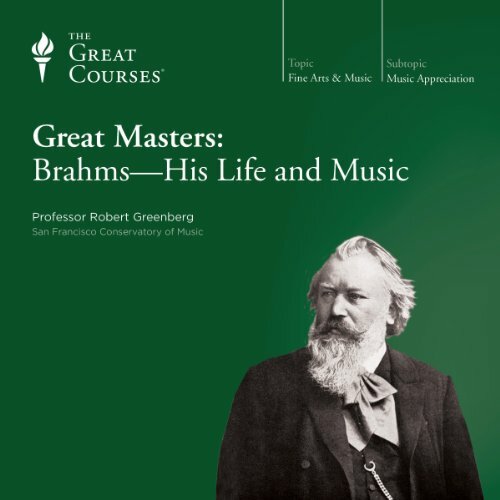 His Great Masters series, of which Brahms is one, is reasonably priced through Audible, possibly a bit less so directly from The Great Courses. But so far I consider them well worth the price. In fact, I sometimes find myself thinking longingly of listening to yet another of Greenberg's courses. They're that good. if only it were 10hrs longer! a great overview of the life and compositions of Brahms. though brief, (mainly the fault of Brahms) this lecture is packed with historical insight and information into the inspirations that Brahms portrays in his music. Once again Robert Greenberg has delivered a truly fine series of lectures.The music speaks for itself but the good Professor makes it both interesting and exciting.